It is with great pleasure that I invite you to a new edition of the Lamèque International Baroque Music Festival. For its 44th year, the Festival will take us off the beaten path as the musicians will pay homage to composers of the Renaissance and Classical periods, the latter of which has been strongly influenced by late Baroque works. The Festival will also feature the music of Antonio Vivaldi, who pushes the boundaries of virtuosity in his vocal and instrumental works, and Georg Philipp Telemann, arguably the most prolific composer of the Baroque era. I am also very proud to announce the fourth Mathieu Duguay Early Music Competition. The event will be a great opportunity to discover three young soloists, specializing in Early Music, who will compete to win the Festival's highest honour. Thank you to all our partners and donors who are making this exceptional event possible. More than forty artists will visit us in Lamèque this summer. We are delighted to welcome back many well- known faces, but also several young musicians who will perform in Lamèque for the first time. 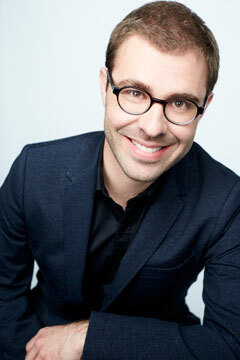 I am pleased to call to our stage, former artistic director of our Festival, conductor and bassoonist Mathieu Lussier. The Italian harpsichordist Francesco Corti, a true star on the Early Music scene in Europe, and several other remarkable soloists, will grace us with their fine talents. The 2019 Lamèque International Baroque Music Festival promises surprising discoveries and moments of great emotion through unique exchanges between musicians and the public. Come celebrate with us! The Lamèque International Baroque Music Festival is an annual festival dedicated to music from the period of 1600 to 1760, performed on period instruments. Founded in 1975 by harpsichordist Mathieu Duguay, the Festival has earned an enviable reputation on the New Brunswick and Canadian musical scenes, and even abroad. Each year, the Festival presents a series of high-calibre concerts at the end of July, making it a not-to-miss cultural event in Acadie. Most concerts are presented in churches and halls on the picturesque Lamèque Island, of which the colourful Saint-Cécile Church in Petite-Rivière-de-l’Île with exceptional acoustics. Over the years, the Festival has proven to be one of the most interesting musical events of its kind in Canada, with concerts respecting the aesthetics of the Baroque era. Each season, the Festival presents outstanding performances on period instruments (or replicas). Its program includes vocal and instrumental selections, featuring choral works, chamber music and solo pieces by renowned musicians. From the seed of a single harpsichord recital in 1971, the Festival came into its own in 1975 and was incorporated in 1976. Since then, many memorable concerts have been presented in the intimate and charming settings on Lamèque Island and surrounding area. Over the years, numerous world-renowned musicians have performed at the Festival: Musica Antica Köln, Il Tempo et Florilegium, the Studio de musique ancienne de Montréal, the Toronto Consort, excellent soloists such as Emma Kirby, Renata Pokupic, Agnès Mellon, Shannon Mercer, Karina Gauvin, and Nigel Rogers; pianofortists Steven Lubin and Andreas Steir; cellists Peter Wispelwey and Jaap ter Linden; violonist Rachel Podger, not to mention harpsichordists Geneviève Soly, Blandine Verlet, the late Scott Ross, Hank Knox, Blandine Rannou, Luc Beauséjour, and Rachelle Taylor. The Festival's own choir and orchestra, La Mission Saint-Charles, was created in 1985 to celebrate the three hundredth anniversary of the birth of Johann Sebastian Bach. The size of La Mission Saint-Charles varies according to the needs of the music performed each year. The orchestra is comprised of professional musicians while the choir is a mix of professional and experienced amateur singers from the community. Each year, La Mission Saint-Charles presents masterworks of the Baroque repertoire for orchestra, choir and soloists, making each performance a long-awaited musical moment for concert-goers. Since its inception, La Mission Saint-Charles has been led by Hervé Niquet (France), Andrew Parrott (United Kingdom), Christoph Spering (Germany), Bernard Labadie (Canada), Rinaldo Alessandrini (Italy), and Jaap ter Linden (Netherlands), to name but a few. Furthermore, the Festival has been a stepping stone for many Acadian artists, such as sopranos Suzie Leblanc, Pascale Beaudin, and Nathalie Paulin. Between 1977 and 2017, CBC Radio was an important partner of the event, contributing even further to the Festival’s renown in Canada. Season after season, a selection of prestigious artists and a dedicated effort to maintaining high standards for its musical programming have made the Festival a prestigious event that welcomes patrons from well beyond the borders of New Brunswick. Most concerts take place in Sainte-Cécile Church which is an attraction in and of itself. Built in 1913, it was repainted in 1968 by the parish priest in a multi-coloured motif. Its wooden structure offers perfect acoustics for the music, and with its coloured interior, it makes a dramatic impression on audiences.